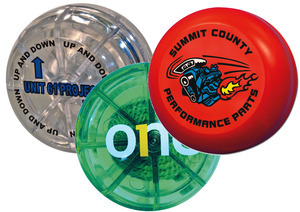 Custom Imprinted Yo Yos, Promotional, Customized, Printed. Standard: Red, White, Blue, Yellow, Green, Glow. Translucent: Red, Blue, Green, Purple, Clear. Yo yo weight 45 grams. Price includes 1-standard color imprint on one side. Second-color imprint: add $0.30 per color per yo-yo (4-color max.). 250 Yo yos minimum order for 3-4 colors. Set-up Charge: $30.00 per color per design. Custom Artwork: Please supply clear, sharp, black and white camera-ready artwork with your order. If multicolor imprint is required, supply camera ready, color separated artwork for each color. If you need artwork preparation, see the following link. Requirements to prepare and/ or to e-mail artwork to us, click here. Production Time: Approximately 12-15 working days. We may need 3 extra days production time for items with second side or additional color imprint. Production time will begin when complete order and artwork are approved. Over or Under Runs: Permissible 5% and billable.